The critically acclaimed author of The Home Place explores the heart and mystery of Big Sky Country in this evocative and atmospheric novel of family, home, love, and responsibility inspired by William Shakespeare’s Hamlet. The only son of a cattle rancher, Anthony Fry chafed against the expectation that he would take over the business that had belonged to his family for generations. While his ancestors planted deep roots in the unforgiving Montana soil, Anthony wanted nothing more than to leave Billings for the excitement, sophistication, and culture of city life. After college he fled to New York, hoping to turn his lifelong love of the theater into a career. But New York wasn’t the dream Anthony thought it would be. Now, with the unexpected death of his father, Anthony suddenly finds himself back in the place he swore he’d left behind. While the years have transformed the artistic dreamer, they’ve also changed Billings. His uncle Neal, always the black sheep of the Fry family, has become alarmingly close with Anthony’s mother, and a predatory mining company covets the Fry land. Anthony has always wanted out of Montana, away from his father’s suffocating expectations. Yet now that he may be freed from the burden of family legacy, he’s forced to ask himself what he truly finds important . . . answers that will ultimately decide his fate. 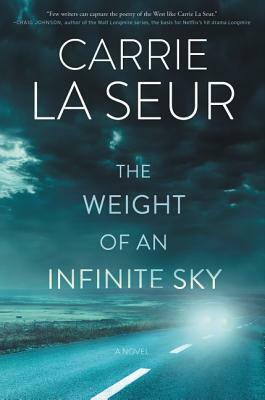 In this unforgettable novel, Carrie La Seur once again captures the breathtaking beauty of the West and its people as she explores the power of family and the meaning of legacy—the burdens we inherit and those we place upon ourselves. Carrie practices energy and environmental law on behalf of farmers, ranchers, and Native Americans, and does a little writing, from an office in Billings, Montana. Her ancestors homesteaded in Montana in 1864 and survived every sort of calamity and absurdity, so the publishing industry seems pretty tame to her by comparison. A licensed private pilot and committed introvert, Carrie hikes, skis, and fishes the Montana wilderness with her family in her spare time. Her work has appeared in such diverse media as Grist, Harvard Law and Policy Review, The Huffington Post, Mother Jones, and Salon.